When we wrote about 4 of the healthiest nuts to eat in a recent issue of EatingWell Magazine, some of you wanted to know why we left peanuts off the list. Our number one reason? They're technically a legume, not a nut. Despite that distinction, they do share a lot of properties with other nuts—they deliver heart-healthy mono- and polyunsaturated fats, vitamin E and zinc, for instance. Still, we wondered whether they bestow some of the same health benefits as tree nuts (such as almonds and walnuts) and we also wanted to know about peanut allergies. So I visited with the Peanut Institute and spoke with a number of scientists and found out some surprising new things about these "nuts." What's your peanut IQ? See if you can spot the truths among these myths. Myth or Truth? All peanut products are off-limits for people with peanut allergies. For the most part this is true, but there is one big exception—highly refined peanut oil. The Food and Drug Administration has said that highly refined oils, such as peanut oil, are not considered "major food allergens." That's because protein, which triggers the allergic response, has been removed from the oil. (There may still be a very small trace of protein in the oil, which the FDA says is not sufficient to trigger an allergic response. That being said, I can understand not wanting to take the risk, when there are so many other oils out there). Aromatic peanut oil, on the other hand, is less refined—it's basically extracted from pressing the peanuts—and therefore contains peanut protein and needs to be avoided. Myth or Truth? Peanuts are fattening. It's true that peanuts have fat, but it's the good-for-you mono- and polyunsaturated kind that tree nuts also have. They won't make you fat if you watch your portion size—1 ounce of peanuts (32 nuts) delivers 166 calories. 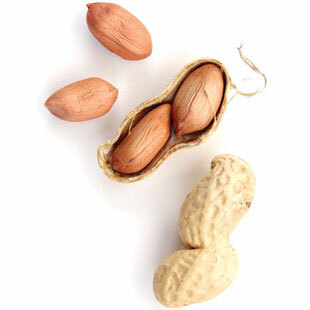 Like other nuts, peanuts also contain fiber, which helps make them satiating. A recent study gave middle-schoolers peanuts as afternoon snacks. In combination with other lifestyle interventions, such as exercise and nutrition education, researcher Craig A. Johnston, Ph.D., has found a significant decrease in the students' BMIs compared to the group that did not receive the intervention. He in part attributes the decline to the fact that peanuts replaced other "empty calorie" snacks, such as chips and soda. Myth or Truth? Peanuts contain some anti-aging compounds. Peanuts, especially the skin-on variety, contain resveratrol, the same compounds found in red wine that may slow cellular aging and promote heart health. Boiled peanuts have the highest levels, but roasted peanuts also deliver a healthy dose. Myth or Truth? Peanut flour is gluten-free. Although this definitely would count as an allergen for sufferers of peanut allergies, peanut flour is gluten-free. It has a slightly nutty flavor and can be used in baking or to coat fish or chicken before saut&eacute;ing. Interestingly, it's high in protein and fiber and comes in different levels of "defatted-ness" (flour that has had more oil pressed out of it is higher in protein). Myth or Truth? People who eat peanuts have lower rates of some chronic diseases than those who don't. Nut consumption has been shown to lower risk of cardiovascular disease and diabetes, according to some studies (and, yes, even peanuts count). What's your favorite way to eat peanuts?